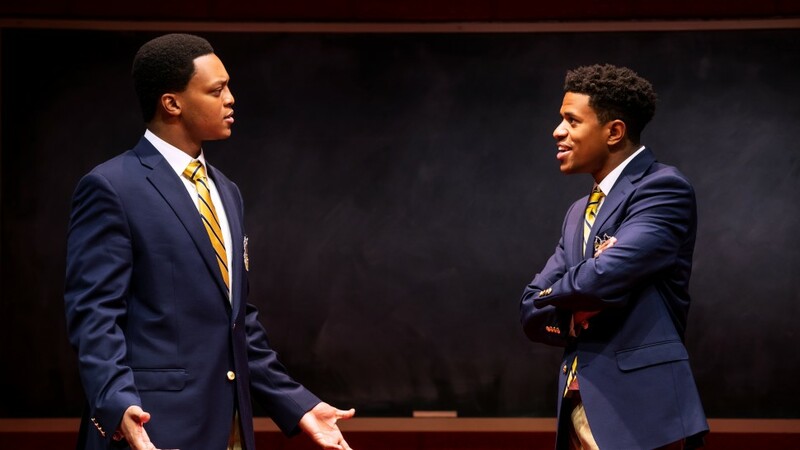 The tension is quickly spotted along with the glorious harmonies in the touching, beautifully written, Choir Boy, a coming-of-age play by Tarell Alvin McCraney, Academy Award winner for his screenplay, Moonlighting. Presented by the Manhattan Theatre Club, Choir Boy is now a stunning production at the Samuel J. Friedman Theater and McCraney is a welcome new playwright on Broadway. Pharus Young, bright, charismatic and the outstanding singer at Charles R Drew Prep School for Boys, is chosen to sing for the current Senior graduation class, a prestigious honor. Drew Prep is a Christian, African-American school for gifted young men and is known for its gospel choir. At the top of the play, Pharus, just entering his fourth year, begins to sing the school anthem, "Trust and Obey," when a fellow choir member, Bobby, begins mocking him in a sotto voce, "Sissy." Pharus' concentration is broken and he momentarily stops, looks around, then returns to smile broadly at the audience. Later, Pharus is called into the Headmaster's office. Headmaster Marrow, played with stout pride and dedication by Chuck Cooper, asks Pharus for the name of his harasser. Pharus refuses to be a snitch, and instead asks, "Would you rather be feared or respected, Headmaster?" Fear or respect -- these are recurring propellers urging on Pharus and his fellow choir singers, adolescents the struggles of peer pressures, school and living up to their parents' and community expectations. Added is the perspective of studying American civil rights when the Headmaster hires Mr. Pendleton, a rumpled dedicated white teacher of "creative thinking." Beautifully played by director/actor Austin Pendleton, he has fought for civil rights for many years and now finds his students' racial and economic slurs toward each other unbearable. Both Cooper and Pendleton deliver layered meaningful performances. Director Trip Cullman tightly steers his cast with meticulously deep characterizations and a fluid moving story. Pharus, played with a cocky vulnerability and an irresistible grin by Jeremy Pope, is overtly flamboyant and finds great personal satisfaction when he is chosen as leader of the choir. A mix of arrogance and sensitivity, he struggles to come to term with his sexuality. Desperately wanting to be viewed as a conventional manly "Drew Man," Phalus, a scholarship student, is constantly derided by quick-tempered Bobby Marrow (J. Quinton Johnson), who happens to be the homophobic and privileged nephew of the Headmaster. Secondary characters include Bobby's cohort, Junior Davis, played by Nicholas L. Asch. Caleb Eberhardt portrays David, a wistful, devout young man. Pharus has a sudden violent run-in with Caleb leading to Phalus' disappointing removal as choir leader. Anthony (John Clay III), a handsome and straight jock, is Phalus' laid-back roommate, confident enough to show empathy toward him. Since Phalus has long refused to go to a barber shop even though his mother was coming for graduation, Anthony offers to trim his hair. Phalus is especially downcast at this point since he has to watch his nemesis, Bobby, who replaced him as choir leader and will sing the school anthem at graduation, something Phalus had longed to do before his ouster. Emotions are expressed in the remarkable musical sequences of the choir, beautifully harmonized spirituals sung a cappella born from generations of discrimination and struggle. Unforgettable is the sound of tired, lonely boys singing, “Sometimes I Feel Like a Motherless Child.” Directed and arranged by Jason Michael Webb, the music highlights the strong black rhythmic backbone of American songs. Additional pop-gospel music is by Fitz Patton, and Camille A. Brown's choreographed dance sequences, are percussive, vibrant and athletic. Choir Boy shines brightly with the emotions and humor of human essence, young exuberant talent and glorious musical sequences, as well as the energy and infectious Jeremy Pope as Phalus Young. Running Time: One hour, 45 min. No intermission.